“If the Devil says to you “Do not drink”, you should reply to him “On this occasion I shall drink and what is more, I shall drink a generous amount.” (Martin Luther). To Martin Luther and most of his contemporaries the devil was a theological and material reality – to be confronted every day and by everybody. 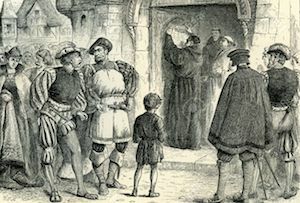 The lecture traced Luther’s view of the Devil and the supernatural and place it in the context of the world views of his time. On the 500th anniversary of the beginning of the Protestant Reformation, this UWA Institute of Advanced Studies – Centre for Medieval and Early Modern Studies Lecture Series reconsiders the legacy of Martin Luther, who in 1517 published Ninety-Five Theses criticising the Church’s sale of indulgences. From diverse historical perspectives, UWA researchers tackle key issues regarding Luther’s life, his thought, and his significance for the momentous changes that Europe underwent during his lifetime.